Yesterday I had mentioned that I felt as if my creativity was running dry. Well, it’s doing much better today as it didn’t take long for me to be inspired for today’s card. I was watching an episode of Restaurant Impossible that I had tapped last night, and the interior designer, Tanya, created a warm, modern vibe for the restaurant. She used yellow, gray and white in the design of the space for a more cohesive vibe, since the previous design lacked any personality or color. She used bold, graphic elements throughout the restaurant, and you know how much I’m a sucker for bold, graphic elements that I had to put them into a card. So, using their design as inspiration, I put my own twist on today’s card. 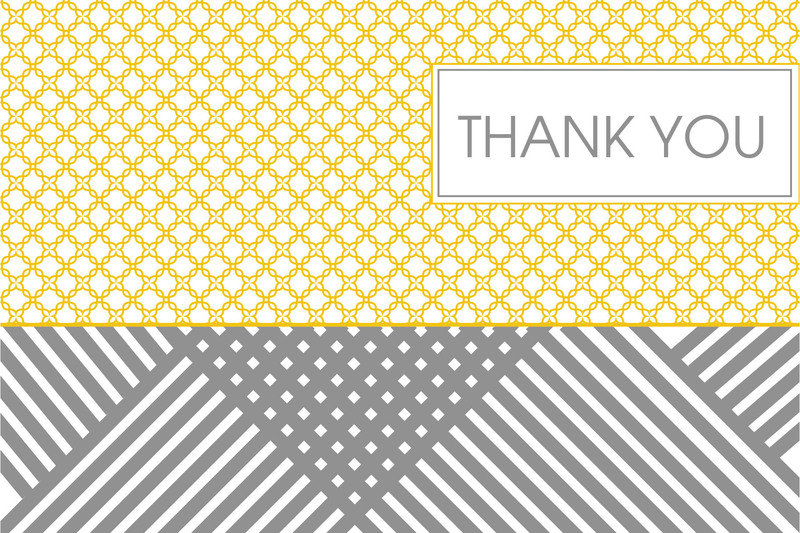 This entry was tagged blog, blogs, card, cards, colorful, colors, design, graphic design, pattern, patterns, Restaurant Impossible, retro, retro and vintage design, retro design, stripes, Thank you, thank you blog, thank you card, thank you card blog, thank you cards, white, yellow. Bookmark the permalink.